Over the last weeks three new public testimonies written by “New Kadmapa Survivors” have been posted under the real name of each author on the New Kadampa Survivor Actvists Facebook Group. With a heavy heart, I quietly stopped going to the center. No one ever contacted me to see where I went or what happened, even though I’d been very close friends with them for 5 years. They all unfriended me from Facebook after I posted a picture of the Dalai Lama with a quote about kindness. It took me years to come to grips with the fact that I was in a cult. My entire life was built up and then shattered. I’ve been going to therapy ever since but I still am very distrustful of people, particularly dharma teachers. I haven’t been able to meditate because every time I sit my mind is flooded with memories. The NKT is an extremely dangerous organization that has ruined the lives of a lot of genuine spiritual practitioners. I hope that anyone reading my story will think twice about joining their ranks. Thank you Ivy and all those who started to speak up! What struck me was that IVY never did get to seeing Geshela all those years. Hopefully the empowerments received were from qualified members who themselves had already received the empowerments fully from Geshela. That makes them lineage holders?? ?……don’t know how that works @ NKT. It’s most beneficial (healthy) for dharma centers to be open to visiting teachers. This might also act as checks & balances for the resident Guru Himself. To be so cut off and isolated from one’s peers & put up such a pedestal now sounds so naive (well intentioned I’m sure). Seems like NKT has put much effort into Wealth Aquisition & Expansion in such a relative short span of time . And one gets to be a teacher within less than a year? Learning a lot about life at NKT centeres………….Ivy and all the others thanks so much for sharing your testimony. In NKT there is no lungh. Only empowerment. To give an empowerment you just recite a certain amount of mantras of the respective deity. JigmeYeshe might know the exact details. Its all watered down and only few necessities are needed to grant an empowerment in NKT. The qualification of the person who gives the empowerment doesn’t play a role only his or her “faith in Geshe-la” matters. Quite an insult to members who gave up so much – only to receive such a watered down version of Buddhism. Where is the Great Kadampa in ALL this? Its a one man show, his books, his tradition, his purity, his students, his centers, his protector, his greatness. @Tenpel: are you a psychiatrist? And is Tsem rinpoche one of your clients? Can you post the complete anamnesis? I’m not in the position to judge Tsem’s mental state since I’m not a psychiatrist. My judgements would be – like yours – as layman’s talk on rocketscience: mere prejudice not hindered by any knowledge. So how can one truely agree with something one knows nothing about, Tenpel? It seems you can’t see the fallacy in your own argument or you refuse to see it. You wanted to establish Tsem as beyond investigation and that only experts – like a psychiatrist – can judge him. This is plain wrong. Ordinary people were able to judge the Buddha and Devadatta as what they were – not everybody of course. What you suggest, Marc, is common cult tactic: its beyond your scope to judge the master, therefore the person judging the master can only be wrong. What you miss is that the Buddha and Buddhism in general set a good example and encourage to make up your own mind about good and bad spiritual friends or good and bad teachings. It is a misunderstanding or a wrong view of many Shugden lamas and their followers (or cultlike Buddhist groups) that a lama is beyond comprehension and can’t be investigated or judged by a student of the Dharma. In fact any student of the Mahayana Dharma must as a prerequisite be able to discriminate wrong from correct teachings, faults from qualities and good from bad spiritual friends. It is not about (the supposed tabu on) judging the teacher, it is about being in a position and having the ability to judge others in general. I asked you if your are in a position, and have the ability to know Tsem’s mind, and about your knowledge of Tsem’s mind. You try to revert the question back to me. But I did not judge you, I did not claim anything about your mental state. I merely asked you these questions. And who is this “Marc” you are talking to in almost all of your mails lately? I agree, this might go too far, and any objection to it is feasible. On the other hand, I had already two Buddhist teachers with a narcissistic personality disorder syndrome and at least for one of them two psychologists confirmed that they assume this disorder. So, at least I have a 6 1/2 year experience with Buddhist teacher suffering from a narcissistic personality disorder syndrome, therefore it is easier for me to detect some similarities or signs. But for sure, to judge this correctly you must be a psychiatrist. I wholeheartedly agree with you. With respect to “Marc”: Recently new commentators popped up in an unexpected frequency and it was not clear if your comment is just a new pseudonym of a person blocked from posting due to trolling. So, I assumed you are just another sockpuppet of that person. Hopefully you are not. If you are it sooner or later it will become obvious. For the time being I assume good faith. Did these psychologists examine these teachers, or is this judgement based on testimonies of others about these teachers? if the latter is the case, and if those people are all ex-NKT, then these testimonies could be biased. In that case we both agree that this judgement of ” narcissism” goes too far. So the question then becomes: why do you persist in this biased layman’s judgement? I think it is fair enough to say my opinion and to judge this based on my observations and experience. I think I don’t persist or insist on my view. Is it fair enough to state your opinion if you see it yourself as an opinion that might go too far? Anyone can say what they like even if they themselves think they go too far? Anyone can use medical terms such as “narcicism” freely though they lack any medical background? Can you tell more about these two psychologists that confirmed your opinion? Did they give their opinion on your request, or on the request of these teachers? Can you substantiate your claim further, since it is very unlikely that a professional psychologist would give an opinion on someone’s mental state or disorder, merely based on third person accounts that might be biased. I agreed that my comment might go too far. I can live with that error and I will be more careful in the future. Thank you for pointing out this fault. For me it is just a direction to think about and to consider a topic. I picked it up and read books and papers about the narcissistic personality disorder and I had a lot of discussions with befriended psychologists. All of this helped me a lot to understand these teachers and my experiences with them. Understanding helped me to forgive and to let go. So I am in peace with this topic and I don’t see anything bad in it. Even if it was biased it just helped me, and why should it not help others to consider this topic and to look on a situation from that perspective? I don’t claim its the only way to see things. So the fact that it is helpfull and functional for you makes it a valid and correct means? And should I see this as an advice to view one’s teacher as a narcist? Or an advice to see ones FORMER teacher as a narcist, in order to reduce cognitive dissonance in yourself? What you put as my views here aren’t my views. You distort what I said and what I meant. One of my teachers has rather for sure a type of a narcissist personality disorder. This has been suggested by 2 befriended psychologists, one of them knew that teacher. To read and to study books and papers about this disorder helped me to understand my experience and it helped me to understand the behavior of that teacher. Having understood it in a better way helped me to forgive, to let go and to heal. It helped me also to develop compassion for that teacher. If you can’t understand the merits of this, it tells more about you than me. There are fairly typical behaviour patterns with stongly narcissistic people that are plain to see when you watch a person. Now for a complete diagnostic of the narcissistic personality disorder of course a practitioner has to assess the person 1:1, but observation can give a fairly good idea whether such a mental illness is present or not. How can forgiving another for being a narcist help us to let go of the “fault” we ourselve have made by taking refuge in that narcist (without investigating that teacher sufficiently first before we take refuge in him/her)? It’s nonsense and therefore a clear example of cognitive dissonance reduction. Merely saying you have let it go and healed it, doesn’t make it so. The fact that you post your “diagnose” about him/her as a lay psychologist makes it questionable that you have let it go. Do you often act impulsively Tenpel? And couldn’t that be what you have to work on. In order to prevent that you jump to the next teacher and the next ordination? New Kadampa frequently hold meetings with themes like: “Three Trainings for Happiness” and “Improving Relationships” and “Overcoming Anger” none of which are conducted by trained professional psychologists, are they? Generally the cost for this advice is around ten dollars. Recently the NKT cult (which they claim has “no political affiliations”) launched a website called Anger Management Techniques. After a couple of paragraphs of platitudes about anger is a naked pitch for Tharpa books. Pure hucksterism and commercialization. Dear all, please let us keep a level of respect and lets avoid to become cynical. I deleted different comments. I will only approve comments for a while that focus on the topic being discussed and I won’t approve further comments that only focus on people’s characters or their abilities/lack of abilities. It is his right to do that. He is advocating a slavish devotion / a Christian type of obedience that is so common for shugden lamas and their followers. Tsem’s teaching mainly asks you to stop to use your brain and common sense and to totally entrust yourself blindly to the lama. 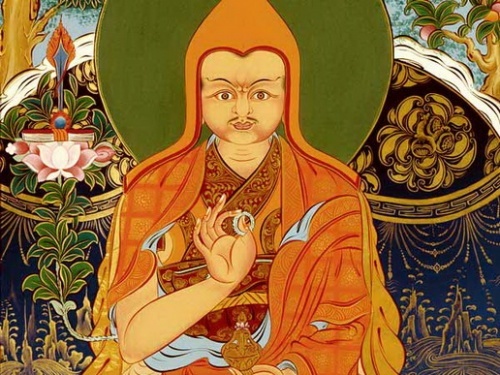 The majority of shugden lamas – including Tsem – seem not to know Tsongkhapa’s commentary on the vajrayana vows / damtsigs and prefer to teach their students slavish obedience. This type of total obedience had brought the Germans the nazi regime and it can form the basis of many types of cruelties or totalitarianism. (See also the Milgram experiment). I have even heard many people criticize even the Dalai Lama. That is their prerogative but I choose not to because I do not wish to hurt the sentiments of many millions of his followers. I choose to see the Dalai Lama as doing the best he can, with lots of pressure, problems and heavy responsibilities. So my world view of things is to just let these lamas be and let their disciples be, and let everyone practice what their lama teaches with full freedom and no criticisms. That has always been my view. I am both liked and loathed for my views, but those are my views. How hypocritical is this if he and his students really run the slanderous and untruthful DS.com site? For example, for myself, my root teacher is His Holiness Kyabje Zong Rinpoche and Zong Rinpoche has given me a set of practices for me, my life and my enlightenment. I have been following it diligently for the last 25 years. Suddenly, there are people and lamas and students who tell me Zong Rinpoche was wrong. Well, Zong Rinpoche has passed away so I cannot go and get his permission and ask, “Can I stop such and such practice you gave me?” The new lama cannot override Zong Rinpoche. If I were to stop any of my practices given to me by Zong Rinpoche, I would need Zong Rinpoche’s permission and no new or other lamas can override his word. That applies to everyone in any practice, with any lama in any situation. Do you not enjoy freedom of religion? Would you like to be banned from schools, segregated from your people, disallowed to enter businesses and separated from family because what you practice is considered bad by another group? In conclusion, I most humbly and respectfully request all spiritual teachers of all traditions, leaders and their subordinates to never demonize another person’s faith, belief system or deity. I will see who I want and associate with any group I wish, any time I like and no one has the right to tell me otherwise. And if they have the right to tell me otherwise, I have the right to tell them back, they are wrong. For ecumenical debates, there will never be a beginning, an end or a middle. It is a convoluted alpha and omega, and I don’t want to get into these debates or be condemned based on them. Let’s make it simple – I have a guru, a lineage, a practice and a goal and I am going to stick with it until the end of my time. No one in the east, the west, the north or the south, on a big throne or standing next to the throne, with or without power, will influence me otherwise. And if you continue to speak and write on and on about how I am going to hell, I am on the wrong path, I am not listening to the correct authorities, you will end up creating your own little hells in your own little minds because I am happy with what I have, I am a pretty good person with my faults, and ultimately I am fortunate enough to be reincarnated into a country and civilization that agrees with my thoughts. So no one’s criticisms, doubts and anyone living in the free world can say otherwise unless your body is in the free world and your mind is not, or your mind is stuck in 16th century Europe. It matters not (for me atleast) whether Tsem Tulku does DS practice or not. Or for that matter anyone. What concerns me is – who are the people behind DS.com? We are here to correct & challenge the ‘slander’ and ‘rubbish’ that they churn out. Talk is that Tsem tulku & his people are involved in the DS website. If it is true; then as mentioned here -this completely disqualifies him as a teacher. Tsem’s chelas & students need to come forward with a yea or nay. Got to be some Tibetan(s) hand involved & closely. Tsem Tulku is not a qualified teacher anyway. He dropped out of his Gelug education very very early. This is also an important point and maybe more important because it would demonstrate his mind set and every body can see if the wish to follow him. Is there any evidence that about the fact that he is reported to have said that he is the new Drakpa Gyaltsen incarnate? If this is true, he IS Dorje Shugden, ha ha ha. so, which lama wears a pandit hat, has big frowning eyebrows, a moustache, holds a longlife vase in left meditating hand and lotus stem holding book and sword in right teaching hand? The statue actually looks like it was modelled on the painting quite exactly. We had all read the news that “Tulku Dragpa Gyaltsen has returned” (from Tsem’s own website.). Now we know who he’s come back as. I wonder why Tsem Tulku is so coy about being open and public about it. Thank you. All too crazy. The NKT/ISC arm now for their Rome protests. Just saw one of their emails and press package: CRAZY! Tsem Rinpoche says very often that he is not enlightened. He never puts himself above anyone else. Do any of you criticizing do even a 3rd as much in way of charity and helping others. Tenpei do you claim to know more than the teachers of Tsem Rinpoche? It sounds like a lot of people here have a personal grudge. WOW nice Dharma practice in action. Go study more. Frank. Tsem seems to have a lot of energy as do his followers, the latter attacking anybody with nasty means who criticise him. On twitter his followers are leading a misleading campaign in which they present him as the poor victim of “the Dalai Lama’s ban”, even wrongly equalising him with the campaign of black lives matter where real people have been killed. In light of that no Shugden proponent was ever killed but Shugden opponents were killed this can’t win the respect of any person with some common sense. As long as he and his followers play such games – including running the site ds . com with a lot of slanderous and incorrect material and claims – he won’t be respected. You, he and his followers have to live with that. Tenpel. Aren’t you Tenzin Peljor who is supposed to be an ordained monk? I am shocked that you seem to have a habit of criticizing other monks, especially Shukden monks. What does anyone’s practice, wrong or right, have to do with you? As a monk you are not even supposed to offer your opinion unless your counsel is sought. Why not focus on your own practice, write good dharma books or start a centre and be a source of uplifting energy instead of always condemning others? How odd that anyone should believe a monk who is so full of prejudice and divisive speech. Why not be a peace maker instead. Very strange monk you are. Anyway I wonder if you will actually publish this comment that doesn’t paint you in good light. Dan what is so shocking? Did you expect that I am silent after I have followed for more than six years Shugden lamas and got aware of some of their behaviour? And then why can Shugden monks offer their opinion and I can’t? Why being biased? All what you say you should equally say to Tsem and his followers or Kelsang Gyatso and his followers. What is right for them why is it wrong for me? Dan, by that measure why does Tsem (ordained but wears lipstick) and NKT (not ordained but wear western suits to do business) not close down their hate websites and multiple Twitter accounts and erase all the ridiculous pro-Chinese political comments and focus on their respective dharma malpractices quietly? No? Why not? I guess the easy money and idle lifestyle is just too hard to turn down. To answer your question, what’s the difference between you and me? Well I am not a monk who has taken vows and I am as samsaric as they come. So if you’re still taking me as a yardstick as to what you may be allowed to do, then you might as well return your vows. Or perhaps you don’t regard yourself as having to keep any of the vows you took, such as not creating schism amongst the monks/sangha? Your logic is that Shugden lamas are bad and offer [bad] opinion, so why shouldn’t you offer your own bad opinion? How are you different to the Shugden lamas then? From what I can see here, as bad as you claim Shugden people to be, how different are you here? This whole thread has nothing constructive or dharma innit. Dan, its not against the monk’s vows to criticize others. Pls get informed and don’t twist the facts. My logic is if you accept it as the rights of others – including your own rights – to criticize others, you have to accept that this is my right too. When you ask what right does TP have to comment on others behaviour, aren’t you doing exactly that? If a Buddhist sees someone about to harm another person, is it wrong for him to warn the potential victim? You’re interpretation of how a monk should behave is naive and hypocritical. Very much like Marc. The one good thing that Burcha Bugayeff did was be honest (after years of lying) that he worships dogyal. Other than that, it’s all just stuff to make him look good; self-promotion and self-agrandisement, helped along by his unpaid online army of cult ghost writers. Using charitable initiatives ostentatiously is a common ploy used by charlatans. Research Jim and Tammy Bakker: Jim ended up doing hard time here in America. It is clear Tsem puts at least as much time and money aggrandizing his persona (or ego if you prefer) as with providing soup: the golden thrones, the gigantic resin statues, 50 foot photo of himself on the Kechara building, selling plastic statues and “puja services” online…the list just goes on and on. One is justified, therefore, in posing the question are these self-agrandising gestures appropriate works of a humble monk or scholar? “if you had tried to post a comment to ds.com and included any words including expletives and names of any lama, the post would be posted. If you included the word “tsem”, the post would be ‘awaiting moderation’ forever. Take away those 4 letters and it would post with no problem. I think the similarities between dogyal websites and Tsem’s other websites are too great to ignore. The whole issue over Losang Tenpa, NKTers saying Tsem is behind dogyal.com and dogyal.com threatening to close, really, no there no other reasonable conclusion to make. The attempt at denial that was posted on the youtube videos is totally disingenuous. Throughout the teachings Tsem says he will not give up dogyal, that he will spread dogyal all around the world, that Malaysia needs dogyal, and that dogyal will be the number 1 dharma practice in the world. So, he changed his mind since 2005? Nobody’s buying it. I just wonder why he bothers to keep up the pretense any more. Personally I think Tsem did the right thing. If he is a Shugden worshiper then he certainly has not allowed himself to become embroiled in the quarrel which has become so ugly. More important than who is and who isn’t praying to Shugden and whether Shugden is Manjushri or a lowly spirit, is not to add on to and fuel to the schism within the Geluk community. Especially amongst the monks. Ultimately the damage done is to the reputation of Buddhism and the confusion caused. Vajrayana is mind boggling enough as it is. Surely the overall good of the religion outweighs individual thoughts, opinion and preference. The Dalai Lama is Tsem’s preceptor and Song Rinpoche his root teacher and so if he is practicing Shugden then he is doing the only thing he can which is to keep holding on to his commitments to Song but at the same time not get involved in attacking the Dalai Lama. Looking at his blog he has no beef with the Dalai Lama and I think that shows a lot of wisdom and skill. Clearly Tsem is not influenced by the politics of either side and I am sure people from both sides have tried to get him involved because of his influence. In the ultimate analysis, it is a question of whether one takes one’s vows and commitments seriously. Moreover, one does not have to be on either side and is it not possible for a person to still revere the Dalai Lama and yet continue to believe in Shugden? Why does it have to be either or. In the end, there is no good or bad as the Buddha taught. There is only skillful or unskillful methods to achieve something. I don’t like to see the protests against the Dalai Lama but neither do I think it is right to single out a particular deity and rubbish its practice. Anyone who believes the reasons given for the actions taken against Shugden practice is either deluded or in denial that there is another agenda that is driving the process. If the comments here seems to be in favor of the Dalai Lama, could it be because the deity in question is not one that you have placed your faith in? Anyone who shows disdain towards Shugden worshipers or the Dalai Lama have prejudice in their heart and it is only a matter of conditions and circumstances before that prejudice manifests in actions for or against a person or religious practice. I thought the whole idea of dharma practice is to weed our prejudice. Some like TDAMDUL says that any comment with the word ‘tsem’ is denied on the Shugden site. I don’t know. I don’t see the necessity to go into any site and use a pseudonym to name any particular person presumably to criticize him or her. For me, there are far too many back seat drivers that are causing more harm than good. It is simple – if you want to keep the practice for whatever reasons, do so. If you don’t then stop. Arguing with someone who disagrees with our faith does not in any way, shape or form enhance our practice. How can it? Some others here made statements alluding to Tsem being unqualified and yet his recognition was approved by the Dalai Lama. How can you look into the mind of a lama and decide what attainments he has if you yourself are unqualified. I would be more inclined to take these comments seriously if they came from someone who is himself a teacher and has started a dharma centre and has some real experience to speak of. It is far too easy to shout instructions from the sidelines. Soccer games and football matches are full of such personalities and yet very few have ever taken to the field. As for the Shugden site, ds.com it has shown incredible restraint. I have been there and frankly I don’t see it saying anything that is not in exercising its right to counter whatever that has been said about the a deity it believes in. I don’t see it disparaging Chenrezi or the Nechung. If there are opinions that seem to be against the Dalai Lama, then it is just that – an opinion and most likely said in rebuttal to statements the Dalai Lama had said. I think the site is open for anyone to contribute articles and opinion to. I mean, if you are going to tell someone that a deity they believe in is a ghost, expect to be challenged. And the challenge is mild compared to fatwas declared on people like Salman Rushdie. I looked at the articles of speeches made by the Sikyong and Penpa Tsering to school children and frankly I was shocked. Imagine if politicians were to go into schools where your children study and start telling them that the religion your family practice is wrong. It is not anyone’s business what my children practice or not practice. I am a buddhist and like all people I have formed certain opinions about other religions. I must have and it is upon those opinion that I made my judgement and chose to be a buddhist. Does having an opinion qualify me to go into a Hindu, Catholic or Muslim school and start telling the students that what the believe in is wrong? If I don’t have that right, then what right does Dr Sangay or Speaker Penpa Tsering have to do that? And what about the other equally anonymous sites that are against Shugden with people making comments incognito? I don’t care who worships Shugden and who doesn’t and I don’t care who runs the Shugden site. If we are to make accusations, let do it as real persons and back it up with evidence. Lets not speculate. The problem people have with ds.com and with the protests is that it stop them from having their wish which is for the Shugden practice to simply disappear. Nothing more. Some brief thoughts after glancing through your comment. While I don’t care who practices shugden because it’s everybody’s freedom & business it is also the freedom and business of others to be informed truthfully, honestly about it because also a student has responsibilities or rights, and freedom. For instance I would never rely any more on a ‘shugden lama’ based on my own experiences with them. How tsem deals this issue seems to be very deceptive, manipulative, dishonest. He has all characteristics of the shugden lamas I met which are: demanding total & blind obedience, denying that gurus have faults and a student should relate to them in a constructive manner which means: you don’t follow the guru when he teaches something contrary to the vinaya and dharma. This is what also Tsonkhapa teaches in his Lamrim Chen mo and his commentary on guru devotion. While His Holiness the Dalai Lama abides by those teachings all the shugden lamas I met overstress and overbend their demands for ‘guru devotion’ making their student blind idiot manipulated sheeps, teaching a narrowed down version of guru devotion and using it to attain too much power over their students. What ever I read or saw from tsem had this very same taste. I guess he might be a cult leader as Kelsang Gyatso is. With respect to the – what my impression of it is: slanderous, untruthful, hateful and non dharmic DS.com site – I am interested to know who runs it to some extend because the site tells a lot about those who run it and I would nobody recommend to rely on such a person, I would rather warn a spiritual seeker. The site doesn’t express in my eyes any dharma spirit but pride, ignorance, a lack of knowledge, selfishness and hostility. If tsem runs it it doesn’t speak good for him but it would fit to what my impression of him is. I am open to see my faults in misjudging him. I fear I might be somewhat correct. You are of course fully entitled to your opinion which I can understand you are fully committed to. However, while it is one matter to have an opinion, it is quite another to label anyone who does not agree with your personal opinion to be manipulative and dishonest. If you don’t agree with Shugden and how some Shugden lamas ‘wrongly (in your eyes) teach guru devotion, then fine. You are not in any way forced to comply with Tsem or any Shugden lama’s behavior nor are you subjected to it. What is it to you if Tsem’s students decide to accept his approach to teaching? Shouldn’t it be up to them instead of you? Do you not think that everyone can think for themselves and how dharmic is it to call someone a ‘blind idiot’ simply because he or she has a different opinion to you? Is that not arrogant and what role does arrogance play in dharma? Furthermore, if you insist that your way is right, why can’t someone else insist that theirs is right? After all no one can claim exclusivity to having the right method and approach. As you know the Buddha taught 84,000 different ways and I am certain that you may not even agree with some of the ways as well. To you, the way Shugden people defend their faith is slanderous, untruthful, hateful and non-dharmic. Shugden worshipers and Tsem can similarly think the same of you but I don’t see them disparaging you simply because you hold different ideals to them. Have we not learned enough to know that everything in our mind are projections, and projections of ourselves at that.And haven’t we learned that the only enemy we should fight is our own mind? If Tsem or any Shugden lama is inherently bad, then it should hold that everyone he comes across would find him to be such, but that is not the case. As for ‘warning spiritual seekers’ I cannot recall a single passage in the Buddha’s teachings that says that the way to enlightenment is to reach out to everyone and warn them that any religion or faith other than our own is bad and to be avoided. Sure, if someone comes to you and ask you directly for your opinion, offer it with good motivation. And if you truly feel that Tsem is a bad lama, then engage him directly and in the open instead of behind his back where he cannot defend himself should he want to. And before you even get to Tsem, are there not countless religions that you feel are not correct paths to liberation? Will you warn everyone against them as well? Surely the best gauge that we ourselves have the correct practice is a rising sense of compassion, not anger and judgement and actions arising out our ego. Only briefly, I lack time. Can we conclude because the Buddha didn’t say any thing about traps of a hunter which catch and strangulate animals that we should not protect animals from those traps and the hunter from harming others? People have to make up their own mind. I just compared what i understand tsem is doing with my own experiences and stated my opinion after you’d voiced your opinion. Anything wrong with this? Yes, let people make up their own mind. Thank you Tenpel. Okay Marissa, very smooth and PR savvy posts but you do not seem to have actually read the site with an objective mind, which betrays your own distorted anti-Tibetan views. I will now go to the cult website and easily extract highly distorted if not outrageously bigoted quotes from current posts…stand by. I’m afraid you simply do not have the ability to perfume this sort of toxic content to Buddhists, Marissa. Should not be trusted until scrutinized. But their food is extremely poisonous. • Commentary: The beautiful, well-groomed appearance of those who deceive others is pleasing simply to behold. One is enchanted upon hearing their suave words. But they are not to be trusted until they have been thoroughly investigated; they must be identified as cunning, bad-natured people, always sizing up others. The peacock possesses a beautiful rainbow-hued body and a very sweet voice, but its food is a powerful poison found in dangerous, precipitous places. and I do not speak ill of anyone. and disparaged another, I renounce and confess that misdeed. ›hostility‹, he is himself at fault. how, then, is Buddhism to be henceforth preserved? and leads them along a safe path. are the blind to be led? then how else are the ill to be healed? Marissa, two points: Firstly, Tenpel is not doing anything behind anyone’s back. He has a blog, we know who he is, and he says what he thinks. Tsem or any of Tsem’s ‘inner circle’ are perfectly free to respond to any comments made here. Sadly, I have seen the behaviour of Kechara people on line for too many years and their lack of honesty and openness contrasts strongly with Tenpel’s online behaviour. Tsem has been very dishonest in hiding his worship of dogyal and lying about it to “Martin” and by extension everyone else. Some websites have defended him on the basis of his dishonest denial. His website actively attacks the Dalai Lama yet he hypocritcally uses images of the Dalai Lama on his blog and twitter feed to advertise his cult. To claim Tsem hasn’t added fuel to the schism in the Gelug community, when he runs the biggest propaganda tool attacking the Dalai Lama (also carrying photos and videos of the NKT protests) is totally disingenuous. I welcome Tsem’s recent bout of honesty and hope he becomes open enough so no one will walk into his Kechara organisation without knowing of his opposition to HH Dalai Lama. Huh?????? Did I post what is claimed that I posted??? that website is meant for gullible newcomers to the cult. If ii need to find truth & fact about this issue- that place would be the last place on my list. Tashi Delek! Lha gyalo – Bhod Gyalo!!! No, that was me. It had been pointed out to me by someone else (and I later tested it) that if you post any word onto the dogyal.com comments (expletives, names of lamas, jumbled gibberish, whatever…) the posts would be posted automatically and be seen by other visitors to the webpage. If you included the word “tsem” in your post, when you came to post the comment it would have the words “awaiting moderation” or something like that under it, and would never be seen by other visitors to that page. Keep the content identical but just delete that word, and it would again be posted, no problem. This rather odd anomaly led some people to think the people that ran the site didn’t want Tsem’s name mentioned in the comments for some reason. Can’t imagine why. This sort of lax speech Tsem also needs to address, increasingly this cult leader is under scrutiny. May I ask you not to insult my intelligence although I admit I am not the smartest person around. Frankly I was disturbed by what you wrote and I found those words to be extremely insulting to Tibetans. That was until I did some Googling and realized that you have simply extracted selected sentences from Shugden’s Forum which is unrestricted for anyone to register and comment. I find this very tricky of you – to take comments from forum-ers and try and pass it off as words of those who manage the Shugden site. A Forum is just that – a virtual public space for people to share, enquire, scold even and unfortunately forums are sometimes abused because people do it anonymously. It is like me taking the same sentences and then showing it to people and say look what Tenpel’s blog promotes. This is not correct. I also realized that you took entire paragraphs from http://www.tricycle.com/blog/guess-whos-buddhist-now-jennie-garth and did the same. How can you expect me to trust you enough to have a proper conversation? Both Shugden and anti-Shugden sites are visited by all kinds of people. Do I take threats or insults left by anti-DS people and then say, look…all Dalai Lama people are like this. No, of course not because that would be unethical and does not promote proper dialogue. I am here for dialogue and if that is welcomed then I shall leave it alone and respect the blog owner’s wish. What you are doing is to try and incite hatred which I find surprising. I am not against you…in fact I don’t even know you. The conversation we are having here should be kept within the scope of dharma and within the boundaries of ethics and reason, and not be subjected to trickery and sleight of hand just to win a point. But in fact Namkhah, the rules of engagement is such that the onus of proof is on you not me. You cannot conjure up an accusation and ask me to defend it. It is you who is the source of the accusation to prove that it is the owners of the Shugden site who have made those comments on an open forum. In any case, I am not here to defend or promote the Shugden site. I am here to try and start a civilised conversation on an issue that has troubled me for some time that is the disharmony that the Shugden controversy has caused. This is the sort of passive-aggressive response one expects from dolgyal cult apologists. Have you never heard of a moderator not allowing through the highly offensive posts such as those I quoted verbatim? It is the responsibility of the editor to filter racist or ethnocentric comments, so back at you, Marissa. The quotes were taken directly from Tsem’s pseudo-dharmic website, not Tricycle, do not try to obscure the point that they are offensive, misinformed and ignorant and cop out to saying ‘I am the objective one here’. Marissa: Compartmentalization as a strategy is off ever since NKT and Tsem’s personality cult have thrown their lot in with the ISC extremists: anyone who does not distance themselves or denounce the ISC rhetoric is advocating their views, as well as deriving financial benefit from China, the ties to which have been conclusively and repeatedly proven. International air tickets have been given away to protesters at an rapid pace: young Zawa Tulku is in Rome again courtesy of ISC funding, his third European boondoggle in the past year, not to mention California, Vancouver and the eastern seaboard of the U.S. and China. That means statements from dolgyal cultists such as these below–gone unchallenged–amounts to advocacy complicity. “The old hoax of “millions of Tibetans” killed by the Chinese are just the usual Jewish-Western propaganda cover for their own continuous and systematic massacres of Buddhist people, from Japan to Korea to Laos to Cambodia to Vietnam. Lucky were the Tibetans, as they were under direct Chinese protection, and therefore the Jewish-Westerner mass murderers, the Muslim Dalai allies, did not dare to openly attack.” Pitanga also compared the CTA to ISIS, etc. with no censure or comment from the cult website admin. LoL WOW Tenpei really. I think you should teach the lineage instead of them. I will be your first student. Why being so cynical? Focus on facts and arguments instead of issuing simple polemics. The above is in reference to Tsem tulku = Tulku Drakpa Gyaltsen =DS. Didn’t mean to have the last chuckle; just turned out that way! Buddha Shakyamuni would never worship Shugden, not in a million years! on the other hand-Tsem I cant say the same. Would I follow Shakyamuni or Tsem, here I have no doubt, definitely not tsem. YOu gotta have no brains for that sort of Guru worship. I have some advice for you all: Get away from all the mumbo jumbo snake oil fast talker preaching and just follow what Buddha Shakyamuni taught if you want to study Buddhism. The rest is just a distraction.